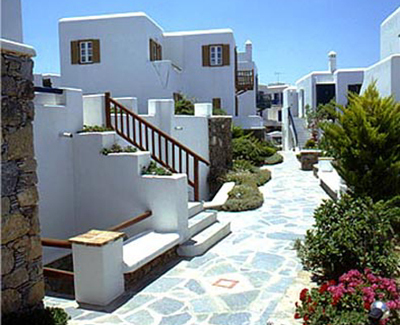 Set in the heart of the Mykonos’ capital, Hotel Semeli seamlessly combines the charm of the old . . .
Set in the heart of the Mykonos’ capital, Hotel Semeli seamlessly combines the charm of the old with the comforts of the new. The founders of Hotel Semeli were dedicated to creating a Greek paradise that would be characterized by authenticity of insular nobility and by modern facilities that conjure up the old craftsmen's skills. As a result, the hotel complex is successfully integrated into Mykonos' traditional style and color, yet is fully equipped for the modern traveler. Although the decorative style is uniformed throughout the hotel, every single part of it has its own identity, creating a cozy and homey atmosphere. The old stately hotel was recently renovated without losing any of its original personality. Its old pieces of furniture mingled with carefully selected new ones, forming the wonderful rooms where visitors can enjoy Hotel Semeli’s unique breakfast-buffet and exquisite cuisine.